Don’t call it a comeback—this won’t be that. 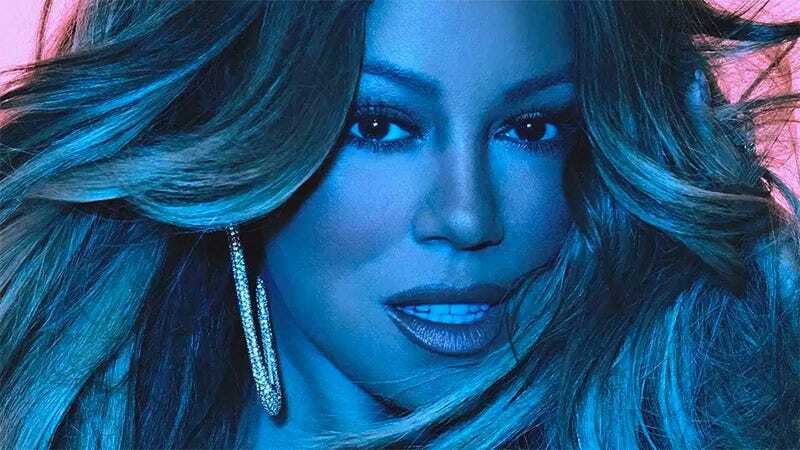 Mariah Carey’s 15th album, Caution, hasn’t spawned any bona fide hits (despite the release of four songs ahead of the album), but the good news is, she at last doesn’t seem particularly pressed. Instead of gunning for the kind of chart success that has defined much of her career, she’s crafted out a self-assured, idiosyncratic record of mostly midtempo, hard-knocking R&B. Caution is a solid album, a supporting beam within Carey’s exemplary catalog. The album is neither an instant classic nor a mar on her legacy. Though more than four years have passed since her last album, 2014's excellent Me. I am Mariah...the Elusive Chanteuse, and though Carey has been working overtime lately on promoting Caution, the actual content is so low-key that the album feels less like an event than a mood. But in a way, then, Caution is exactly the kind of album Mariah Carey should be making in 2018. Given the tremendous success and consistently displayed craft within the past 29 years of her career, Mariah Carey has nothing left to prove. She’s earned this one. There are pillows of backing vocals, melodies with contours like those of ornate vases, songs with real momentum and solid payoff by way of elaborate emotional crescendos. Caution splits the difference between current trends (alternately ambient and bleepy keyboards that 20 years ago would have sounded more at home on IDM albums, soothing snares whose staccato rolling mimic the sound of ratchets) and her career-long devotion to a lush, high-quality product. As has been the case since virtually her 1990 debut, if modern R&B is a Yamaha piano, what Carey gives you is Bösendorfer. There are pillows of backing vocals, melodies with contours like those of ornate vases, songs with real momentum and solid payoff by way of elaborate emotional crescendos. Though cognizant of the sound of now, Caution is more conversant with Carey’s back catalog. The sleepiness and noncommercial nature of the album is reminiscent of 2002's Charmbracelet, as is the album’s prevailing head voice (though unlike Charmbracelet, her instrument seems to be in better shape here and provides a wide palate in itself). It’s also something like a sexually charged Butterfly. The 1997 pièce de résistance of her catalog thus far was sensual and mellow—it sounded like a quiet storm record though lyrically it was prudish. On Caution, Carey enters full-on baby-making mode. “Never too late, you can come through/I’ll be up waiting/I don’t want nobody but you,” she sings on the title track gingerly, holding words in her mouth like mother cats do their kittens. After years of romantic tumult (a divorce from Nick Cannon, a breakup with billionaire James Packer) and what seemed like a toxic relationship with her former manager Stella Bulochnikov (perhaps the “snake” in the grass referenced in Caution’s Lil Kim-sampling “A No No”), it’s great to hear Carey having fun. She giggles throughout the album, does her goofy patois thing on the atmospheric “GTFO” and rattles off a host of languages in which “no” means “no” at the end of the aforementioned “A No No” (though I think she’s wrong about Japanese). “I ain’t the type to play the martyr,” she wheezes in “GTFO,” and lyrically she’s never been less vulnerable than on Caution. For the first half of the album, she calls the shots with the clarity of a traffic signal (“With You” and “The Distance” are both green lights; “GTFO” and “A No No” are reds, and “Caution,” is obviously yellow). But one of Carey’s songwriting strong suits is to verbalize the feelings and moments on the romantic scale that fall between grand declarations of love and loneliness, and for that reason “8th Grade” (co-produced by Timbaland) is the highlight as Carey pines for and fantasizes about her object of desire with the steadfastness of a schoolgirl. Carey’s 10-cent words are as prominent as ever, sometimes to a clunky degree (it really sounds like she just wanted to use the word “ambivalent” when she orders, “Don’t be ambivalent towards me,” in “8th Grade”). And while her storytelling has always been just specific enough to keep her music distinctly hers yet firmly rooted in pop, she falters lyrically on “Giving Me Life” (a collaboration with producer Blood Orange and Slick Rick). She’s clearly going for a set-piece moment a la “The Roof” from Butterfly, but the song is so vaguely worded it’s not exactly clear what’s giving her life (or the parameters of her referenced philosophy is)—“It wasn’t really much at all,” she sings in the chorus, and boy does it sound like it. We don’t even know the particulars of setting here, just that whatever she’s talking about occurred in summer. There is no view of someone who’s been so famous for so long that is without obstruction. More pointed in its vagueness is “Portrait,” Carey’s umpteenth attempt at the piano-vocal of “Vanishing” from her 1990 self-titled debut. This solid entry in that subset of Carey songs retraces some of the steps of “Looking In” from 1996's Daydream (“They’ll never know the real me,” is the last line of that song about the general public’s inherently flawed perception of her). “Look the other way as I bottle myself up inside/I won’t let the teardrops spill tonight/Just conceal myself and hide/This portrait of my life,” she sings, openly acknowledging that her own image is incomplete. Most of her following, to whom Carey seems to be increasingly speaking directly in lieu of appealing to the masses, will never see the full picture of her—there is no view of someone who’s been so famous for so long that is without obstruction. Caution’s tight 10 tracks breeze by in under 40 minutes. Like a warm conversation with someone you haven’t seen in a while that teaches you very little about them but confirms your goodwill, the album comes and goes pleasantly. It’s heartening to see how lovingly this album has been embraced, given Carey’s longterm status as a creative underdog (if you’d told me in the early ’90s that Mariah Carey would one day be a critical darling, I would have laughed in your ear like Carey is prone to doing in her songs). And while I find it hard to be entirely excited about an album that’s so muted, I nonetheless am impressed with just how comfortable and confident she sounds on Caution. The fact that she worked with a different co-producer (or set of co-producers) on each track, yet the resulting collection is as cohesive as any album she’s ever released is itself a low-key flex, a casual illustration that Carey is not just the common thread, but in fact the visionary director of her own output. In a way, Caution is one big flex of an album, albeit one from a performer so great that flexing for her is merely a matter of course.